Artists, mystics and seers have attempted through the ages to give visual substance to the search to apprehend the face of Jesus Christ. Veronica’s veil which miraculously rendered the face of Christ into the fabric used by Christ, as he wiped his brow on his journey to the cross, was the first miraculous representation. Since that time images have been venerated, revered, for their holiness and power of truth, but they have at times also been desecrated or even destroyed as weak and misleading figurations of a likeness that is not able to be represented in human form. 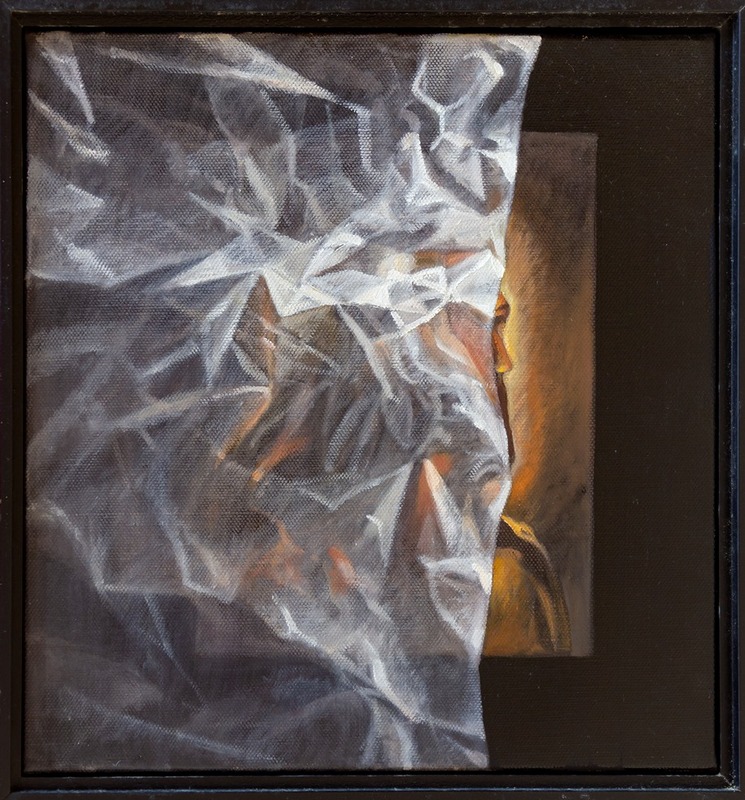 What are we then to make of this depiction of Christ by artist Margaret Ackland, where a copy of a familiar Christ image has been partly covered over by the fine translucency of a crumpled sheet of paper? Lying underneath the surface of Ackland’s work is perhaps a partial reference to the famous work by US artist Warner Sallman, painted in 1940. 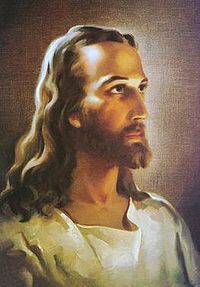 This remains one of the most reproduced images of the figure of Christ, which was widely distributed to US soldiers during the Second World War. Since that time it has served to reinforce the image of Christ as a Saviour who is of European origin with blue eyes and long blond hair. The partial covering of this figure does not reduce its recognition, as many people instantly recognise not just the work, but the face as the face of Christ. This depiction and depictions like it have become normative for many generations of devotional art and have become, in essence, a form of blindness. The artist has introduced a veil-like surface painted across this familiar form. It has obscured and also complicated its likeness and presence. We have to move over and through this veil to see. This physical effort of our eyes is an activity in itself that offers illumination. Acts of veiling slow down our seeing in a manner that draws attention to its limitations and boundaries. Art can illuminate but it can also obscure. This veiling activates an awareness of the depth or distance that is between our eye-sight and our insight. We live in the age of the image, where our lives are animated by vision to live in a state of glossy anticipation, as if in heaven, with all our appetites activated through the consumption of these images. But do we truly see? And do we see what we truly desire? Ackland’s work is a stepping back from easy devotion. This work represents the necessary process of seeing more deeply through erasing the comfortable images of the familiar that activate popular devotion, the kitsch-like condition of some religious forms. This act of veiling is an invitation to see more clearly, to hone the apparatus of our seeing, to realise the prejudices and assumptions we have about the face we call Christ. This Christ might not be our neighbour after all, but the stranger who we fail to recognise on the journey to Emmaus. The artist presents us with a difficulty and visualises a layer of our seeing that often goes unacknowledged. In an age where we are overwhelmed by the sheer volume of images that pull and push our desires, seeing needs this necessary training to not believe in surfaces but in the depth found in erasing familiar icons, in negating comfortable ideas, and pushing towards the difficult Christ who might look more like a stranger, a trickster or the confronting other. Margaret Ackland: Obscure, 2002, oil on canvas, 37.5 x 37.5 cms.